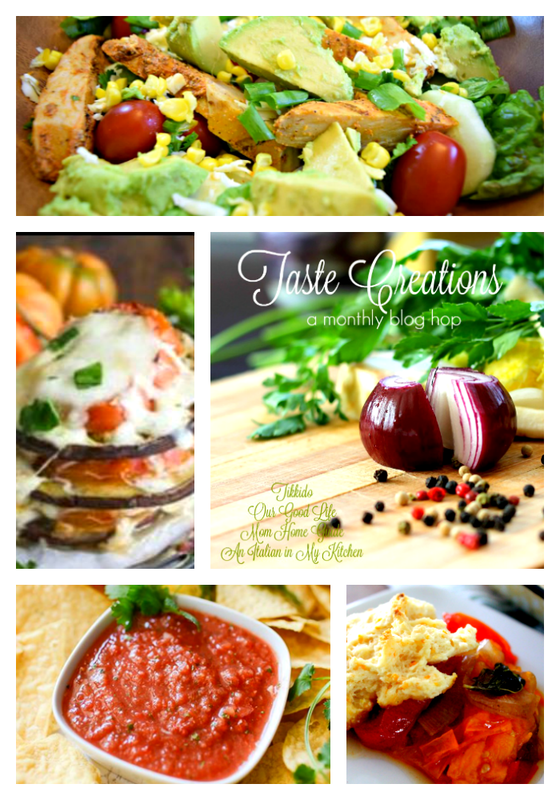 The Taste Creations blog hop is happy to share TOMATOES with you today! Juicy garden tomatoes are starting to hit the Farmer's Market by the gallons so here is a chance to try some great food with seasonable vegetables. For today's recipe, I thought I was going to be making a tomato tart for you, something I make every summer, but I didn't have any pie crust made up. I did have a package of biscuit dough that I wanted to use up, thus this recipe was made! Make biscuit mix according to package directions, set aside. Heat oil and butter. Add onion, brown sugar and salt. Cover, reduce heat and cook for 15 minutes, until onion is tender. Add balsamic vinegar and basil, cook until liquid is nearly gone and basil is wilted. Slice tomatoes and arrange in 4 by 9" baking pan. Roast tomatoes for 15 minutes until juices bubble. Remove from oven, top with the onion mixture and dollop dough on to the top of the onions. Bake until biscuits are done all the way through, approximately 20 minutes. The Taste Creations team, Nikki from Tikkido, Lauren from Mom Home Guide, Rosemary from An Italian in my Kitchen and me, come together to share recipes from our blogs on a variety of different ingredients. Last month we shared Salads and had a wonderful response! Next month we will be sharing sweet corn! Check out these other, wonderful tomato creations! Linking to Thoughts of Home linky party! Jeanine, the brown sugar is crucial. I know people are weird about sugar these days but what it does to the onion and then later, the tomatoes is divine! It's good to have juices for the biscuits to soak up, too! Looks good! That's great that you were able to improvise a new recipe! Enjoy your summer! I love blog hops simply because there's so much that you can learn from the different bloggers that you visit. I really love this recipe and I think it's perfect for the summer! It's light and fresh! Ooh, I have everything but the biscuit mix! We have gluten allergies though, so I will have to sub a gluten free biscuit recipe. Thanks! Oh so Yummy Terri, looks delicious, can't wait to try it. You can't go wrong with caramelised onion and baked tomatoes. Delicious! The adding of biscuits is something I've never thought of but looks so yummy. Love the creative recipe like this! This recipe looks so good and it is so unique. 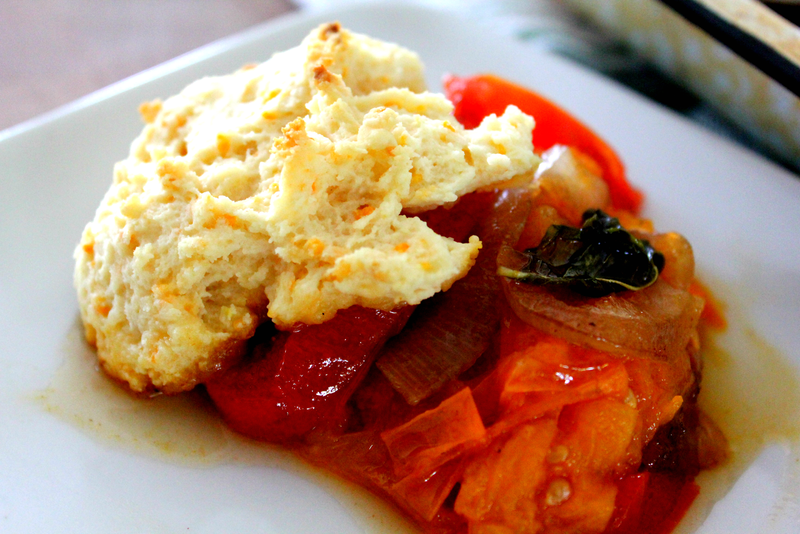 I love the taste and texture of tomatoes in any recipe so I am curious to try them with this flavor combination. I have never tried anything like this before, would be a great addition to so many meals and looks super tasty! Wow this looks absolutely delicious! I have never tried anything like it. Definitely adding it to my list of recipes to try. Terri you never cease to amaze me! 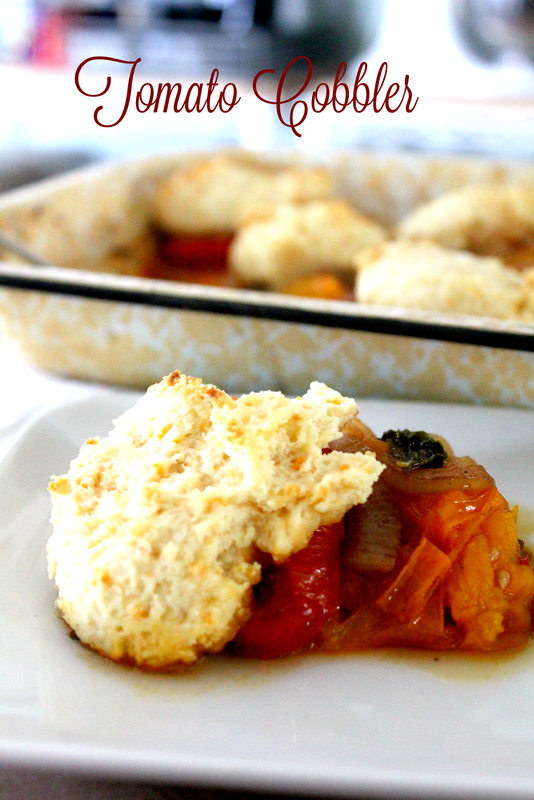 Tomato cobbler, who knew??? Yummo! Thank you so much for joining the gathering at Thoughts of Home on Thursday.